Face Contouring Secrets of the 1940’s. Simple hairstyles for face shapes and makeup contouring ideas. 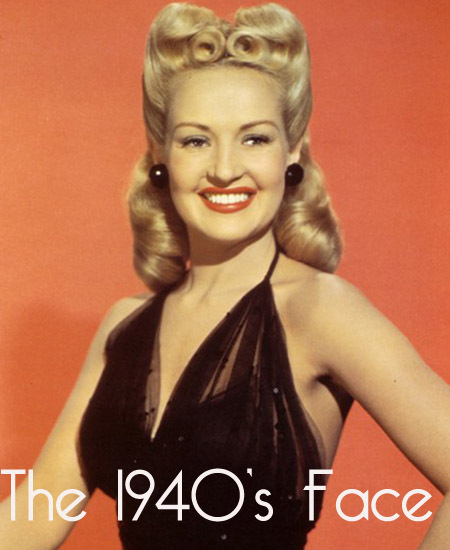 Original 1940’s Hair and Make-up secrets from Vintage Make-up Guides. All 1940’s hairstyles, were generally swept away from the forehead. The correct make-up contour to match this look is imperative. to bring out your inner 1940’s woman! 1940’s Hair and Make-up Tips – The Round Face. 1940’s Rouge for Round face. Wear your coloring high on your cheekbone, and blend if off toward the temple and hairlines. Keep it away from nose, under eye and jaw. 1940’s Lips for the Round face. Accent the cupid’s bow, but in drawing the lower lip, ” square ” the outline with a firm outgoing line from the corners to the center of the lip in a reverse cupid’s bow. 1940’s Hairstyle for the Round face. Wear the hair high to counteract roundness, using a soft wave, curls, or a pompadour. The back may be worn up in a vertical bun or in a chignon. 1940’s Rouge for Long faces. Place the apex of color directly under the cheekbones, and blend it outward toward the ear and hairline. Keep rouge away from nose, eyes and lips. 1940’s Lips for Long / Narrow faces. Eliminate any point at the cupid’s bow, as this tends to elongate the face. For a more generous and rounder look to the mouth, build up the size of the upper lip slightly, accentuating the corners. 1940’s Hairstyle for Long faces. Wear the hair parted, in the center, or with a three-quarter part, keep it flat on top. let it fall in soft waves at the side of the face and in the back. 1940’s Rouge for an Oval face. Place your rouge just below the cheekbones, with the apex of color in the hollow under the cheeks. Blend it upward over the cheek toward the temple, ear and hairline. 1940’s Lips for Oval faces. Follow the natural lipline and draw the corners of the mouth clearly to bring out the full, natural curves. 1940’s Hairstyles for the Oval Face. As the oval face is the happy medium of all face types [ lucky you ! ] practically all hairstyles are becoming. For the very best vintage hair-styling tips and video tutorials, you cannot beat the amazing Lisa Freemont Street. 1940’s Rouge for the Square face. Place the apex of coloring on, but no lower than the cheekbone, and blend upward to the temple. 1940’s Lips for the Square face. Accent the cupid’s bow for the upper lip. For the lower lip, make a reverse cupid’s bow for center, and draw an in-curving line for the ends. This somewhat wavy lip line will draw attention away from squareness of the jaw. it really works ! 1940’s Hairstyle for the Square Face. Wear the hair in an up sweeping wave, but with rounded effect. For more Vintage Beauty tips – try Make-up & Beauty – 1940’s Guides. Now available from Vintage Make-up Guides. Packed to the brim with beautifully restored and illustrated guides from the 1920’s to the 1960’s – as actually taught to women in those glamorous eras. Check out Lisa Freemont Street for her truly brilliant and entertaining vintage hairstyling video tutorials. I just bought the bundle of guides last week. Can't wait to read them and apply some of the info to my own beauty regimen.